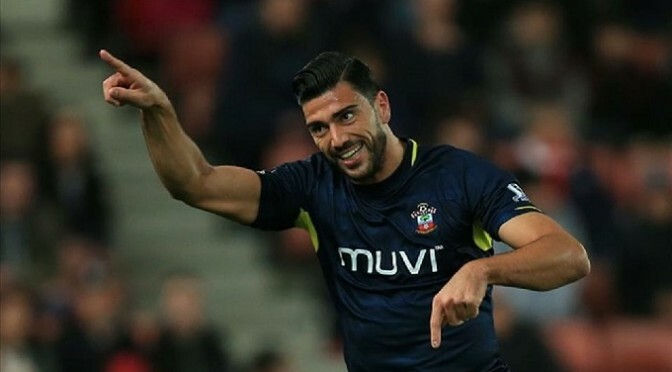 Striker Graziano Pelle claimed his first Premier League goal in 15 matches to help lift Southampton up to fifth place in the table and add to Hull’s relegation worries. Substitute James Ward-Prowse opened the scoring from the penalty spot after former Hull striker Shane Long had been fouled by Tigers defender Alex Bruce. James Chester almost equalised but his header was cleared off the line. Pelle then drove home his 13th goal of the season as Hull stayed in 17th spot. Ronald Koeman’s side have now matched their Premier League record of 56 points which they achieved last season when finishing eighth under Maurico Pochettino. They have won their last three home games, while Hull’s losing run now stretches to three matches and they remain only two points above the relegation places. Hull face a tough run-in with games to come away to Crystal Palace, home to Liverpool, Arsenal and Burnley, away to Tottenham and then at home to Manchester United on the final day. Southampton, also chasing a highest top-flight finish since they came fifth in 1985, have been short of goals in recent weeks with just five in their last nine games. But a return to form for Pelle, whose last goal came in the FA Cup in January, was another bonus on a positive afternoon for the Saints, who rested England international Nathaniel Clyne. Andros Townsend’s spectacular strike gave an experimental England line-up a creditable draw against Italy in Turin. Southampton striker Graziano Pelle’s first-half header looked to have put Italy on course for victory in this friendly as England struggled to get to grips with the changes made by manager Roy Hodgson after Friday’s Euro 2016 qualifier win against Lithuania. England, however, were lifted by the introduction of several substitutes and Townsend capped a second-half display that merited a draw. The Tottenham winger’s rising 20-yard drive 11 minutes from time gave Italy’s veteran keeper Gianluigi Buffon no chance. Hodgson’s side then ended the game on top and only a fine save from Buffon stopped England captain Wayne Rooney – who had earlier hit the bar – from adding to his total of 47 goals for his country and closing even further on Sir Bobby Charlton’s all-time record of 49. The experiment of using Phil Jones in midfield failed dismally and he reverted to defence when Chris Smalling went off ill just before half-time. Similarly, it was a wasted night for Arsenal’s Theo Walcott, misused in a forward role rather than on the wing. There were pluses too, however, with an excellent cameo from Everton’s Ross Barkley and a composed performance from Michael Carrick when he replaced Smalling. 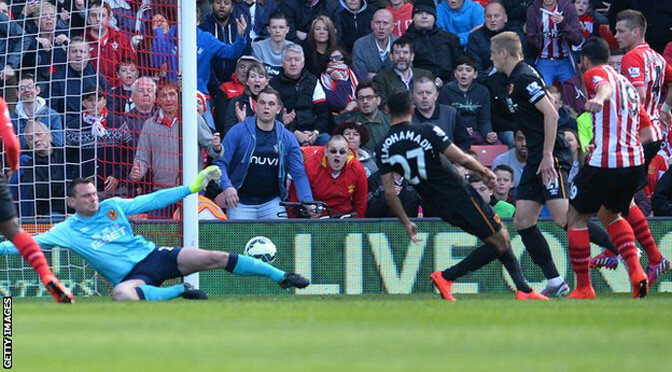 Robin van Persie fires Manchester United to victory at Southampton. Manchester United moved into third place in the Premier League table as a Robin van Persie brace saw them past Southampton. Van Persie ghosted onto Jose Fonte’s loose backpass before flicking home Wayne Rooney’s rangy free kick to seal United’s fifth-straight victory. Graziano Pelle had levelled for Saints with his first goal in six games, but in the all-Dutch managers’ tale of master meets apprentice, Netherlands striker Van Persie stole the show. Louis van Gaal employed Ronald Koeman to coach in his Barcelona set-up but fell out with the former Netherlands full-back at Ajax in 2004. Koeman’s arrival as first-team coach ruffled Van Gaal as he shifted to technical director at the famous Amsterdam club. The rift was set in 2009 when Van Gaal claimed Koeman was “third choice” to replace him at AZ Alkmaar — his parting shot before heading off to Bayern Munich. Both men played down their mutual dislike in the build-up to Monday’s clash, but the frostiness was clear — no handshake before or after proceedings, no love lost. Koeman bested his former mentor in the tactical stakes, but Fonte’s error and a touch of forward-line class edged United home. Saints cut United apart at will in the match’s middle third, Koeman employing Steven Davis to fine effect in front of the back four. Davis completely overshadowed the ineffective Marouane Fellaini, helping Saints shrug off the injury absences of Morgan Schneiderlin, Toby Alderweireld and Jack Cork. But ominous starts do not come more concerning than gifting a striker of Van Persie’s calibre the opening goal. Saints skipper Fonte’s woefully under-hit backpass cleared the way for the Dutchman, and the 31-year-old calmly slid the ball home, between Fraser Forster’s legs. Just as Saints gave too much respect to champions Manchester City in 3-0 defeat on the south coast two weeks ago, so Koeman’s men stood also off United. Slowly but surely, however, the hosts realised they boasted by far the greater tactical balance, and finally started to express their true pedigree. Sadio Mane robbed Paddy McNair and shimmied into the box, only to lose control. Pelle flicked round to Tadic on the spin as Saints pressed again, but the chief creator overhit the through-ball. Chris Smalling limped off with a leg problem, replaced by Jonny Evans, with United feeling the pinch. Italy hitman Pelle teed himself up in the area, but was left to bemoan a deflection that handed De Gea a routine save. Saints’ pressure told though, when target man Pelle delivered after another sustained attack. Fellaini conceded possession all too cheaply to Davis, who raced through the middle and fed Shane Long. The former Hull forward’s cross led Tadic to strike on goal, a deflection ushered Pelle through and he fired the equaliser. Long blasted high and wide in a glorious opening after Mane beat Evans to Tadic’s cross with an acrobatic leap. Van Gaal then hauled McNair off in favour of Ander Herrera, forced into a tactical reshuffle as early as the 39th minute. The shift did little to ease the muddle in United’s midfield, with Fellaini all too often a long-range bystander. Saints burst out of the blocks the brighter for the second half, Long wasting another fine chance when directing a point-blank header straight at De Gea from Tadic’s cross. Tadic turned provider again by sliding a perfectly weighted pass through to Pelle, only for the Italian to fire over the bar. Ashley Young produced a timely clearance from Mane’s low curling cross, and United started to settle. And when Rooney whipped in a dangerous far-post free kick, Van Persie stole round the back and flicked a left-footed volley past Forster. 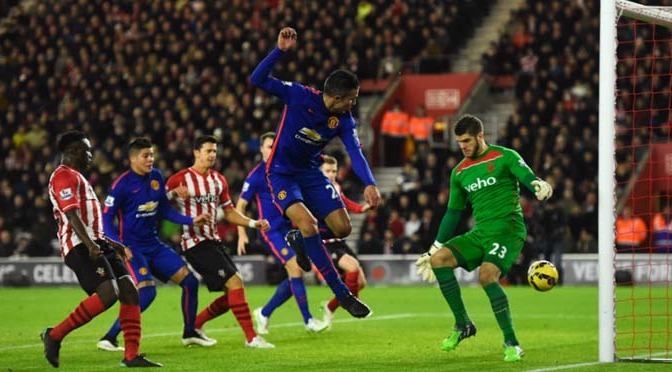 Saints continued to pick United’s system apart, with Mane feeding Pelle, whose blast forced a solid save from De Gea. But despite the rallies Saints could not force another real opening, and United employed all their nous to sneak to victory. Southampton beat Stoke for the second time in four days to reach the quarter-finals of the Capital One Cup. This game was much more eventful than Saturday’s 1-0 Premier League victory, with Graziano Pelle netting his second to make it 3-2 two minutes from time in the Potteries. Saints looked in control at half-time at two up through Pelle and Shane Long’s first for the club but Stoke levelled through Steven Nzonzi and Mame Biram Diouf. However, moments after substitute Peter Crouch was sent off, Pelle grabbed his second to earn Southampton their ninth win in 10 games. Both managers resisted the temptation to make wholesale changes, with 16 of the players on show having started at the weekend. Mark Hughes gave Bojan Krkic a rare start, the former Barcelona forward appearing for the first time in nearly a month, while Saturday’s goalscorer, Sadio Mane, missed out with a knock so Long came in for the visitors. Despite the strong sides, there were plenty of empty seats at the Britannia Stadium, although more than 2,000 Southampton fans had made the trip. And they were celebrating inside six minutes as Pelle notched his ninth of the season. This was arguably his best, the Italian picking up the ball in the middle of the park and taking advantage of the space given to him by the Stoke defence to pick his spot just inside Asmir Begovic’s post from 25 yards. Stoke hit back with a spell of pressure but, like at St Mary’s, were unable to create any real chances. The closest they came was a 19th-minute cross from Jonathan Walters that Nathaniel Clyne got his head to just before Marko Arnautovic. Saints certainly looked to have the greater class in attack and a flowing move ended with them doubling their lead on the half-hour mark. Dusan Tadic played in Steven Davis on the right of the area and he pulled the ball back for Long to slot under Begovic. Pelle should have made it three shortly afterwards but blazed over and salt was rubbed into Stoke’s wounds when they thought they had scored only for Walters’ shot to be ruled out for offside. The striker was definitely standing beyond the last defender but the assistant referee waited until the ball was nestling in the net before raising his flag. The Stoke players came out early for the second half and it took them only four minutes to halve the deficit.